In this paper, a detailed numerical investigation of two-dimensional laminar forced convection in a porous channel with inlet and outlet slot is presented. A uniform heat flux is applied on one wall of channel and another wall is isolated. The flow in the porous medium is modeled using the Brinkman-Forchheimer-extended Darcy model in which the inertia and boundary effects are taken into consideration and thermal dispersion effects are not included in the energy equation. Parametric studies are conducted to evaluate the effects of particle diameter, Reynolds number on the heat transfer and friction factor. Nusselt number and friction factor are developed for efficient design of a porous heat exchanger based on the present configuration. In order to solve this problem Fluent software was used. Recent advances in high-technology fields such as electronic system have lead to dramatic increases in heat flux levels, for thermal management of such systems, more efficient heat transfer enhancement techniques are being explored. There has been a growing interest in heat transfer enhancement using a porous medium and several studies have reported that the use of porous medium for heat transfer yields higher heat transfer performance than existing techniques such an pinned-fin array or twisted tape inserts. Hunt and Tien  experimentally studies forced convection through a fibrous medium and showed that with high permeability porous materials, heat transfer enhancement of up to four times higher than without the porous medium could be achieved mainly due to higher thermal dispersion effects. Kuzay  investigated heat transfer enhancement using metal-wool filled tubes. Hwang and Chao  conducted experiments and numerical simulation for the heat transfer behavior of sintered metallic materials. Hadim  considered discrete porous bands in a channel with discrete heat source on one wall. Vafai  considered discrete porous blocks on one wall of a rectangular channel. These studies demonstrated that with proper selections of governing parameters and different geometric structures of porous medium, could increase rate of heat transfer and reduced pressure drop. on the other hand, several studies concentrated on the physical properties of working fluids for heat transfer enhancement in the presence of porous media. Suzan and Vafai  who discussed heat transfer and pressure drop in a porous medium and fluid thermo physical properties as well as geometrical configurations. Chen and Hadim  described by the power-law model in a channel filled with packed spherical particles. Their results indicate that shear thinning fluid result in higher heat transfer and reduced pressure drop than Newtonian fluids in porous media. Leong and Jin  studied forced convection heat transfer in a channel with different configuration of graphite foams. Marcelo  defined laminar heat transfer in a porous channel simulated with a two-energy equation model. In the present study, a porous parallel-plate channel containing a fluid-saturated sintered porous metal matrix that a uniform heat flux is applied on one of the walls and another wall of channel is isolated. To perform a detailed study of the hydrodynamic and heat transfer characteristics within porous channel, the numerical model for a steady-state, incompressible, and two-dimensional flow in metal porous channel is developed. The flow in the porous medium is modeled using the brinkman-forchheimerextended Darcy model that takes into account the boundary and inertia effects, thermal dispersion are neglected in the energy equation. Channeling effects near the walls are neglected in the present model and porosity is assumed to be constant. The numerical model is validated by comparing the present numerical results with the experimental data. Geometrical configuration of channel is shown in Figure 1. Figure 1. Schematic configuration of the physical model. Ke is the effective thermal conductivity. The governing equation (1-5) with the associated boundary condition was solved numerically utilizing a control volume method. The momentum equation for velocity and pressure drop was solved first and the energy equation for temperature and heat transfer rate was then solved based on the corrected velocity results. After a staggered grid was arranged for the discretization process a second—order upwind was employed to model the interaction between the convection and the diffusion terms in governing equations. An iterative procedure based on the Simple algorithm was employed to deal with the linkage between pressure and velocity in the momentum equations, and temperature in the energy equation. In order to solve this problem with all considered boundary conditions was used. But because doesn’t include equations related to terms of brinkman and forchheimer ,we add up these equations using udf (user defined function) to fluent but before solving this problem using fluent, geometrical configuration are meshed with gambit software. Gambit is the preprocessing software for fluent used for creating and meshing 2-d model. The units are not important while creating the grid in gambit, but the simulation in fluent always requires the input parameters to be in S.I units. For 2-d geometers, the z-coordinate is assigned a default value of zero. Both structured and unstructured meshes are available in gambit. in the present study, structured meshing was employed. Boundary conditions types for inlet, outlet and channel walls were specified and the mesh-file is saved in a binary format for fluent to recognize. In Figure 2 the mesh is created by gambit, was shown. Figure 2. Schematic configuration of the physical model, mesh is created by gambit. Figure 3. Effects of particle diameter on the dimensional pressure drop in the porous channel. Figure 4. Effects of particle diameter on nusselt number in the porous channel. 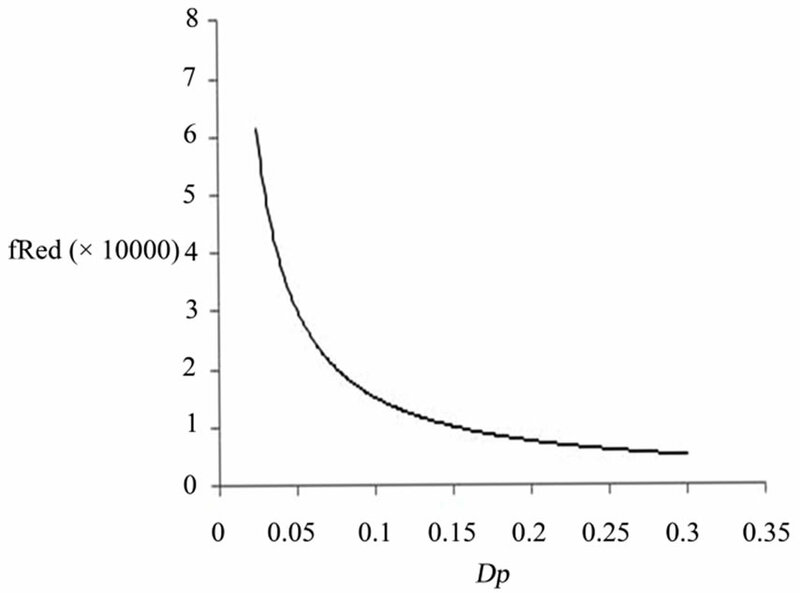 transfer rate is achieved at a larger penalty in pressure drop. 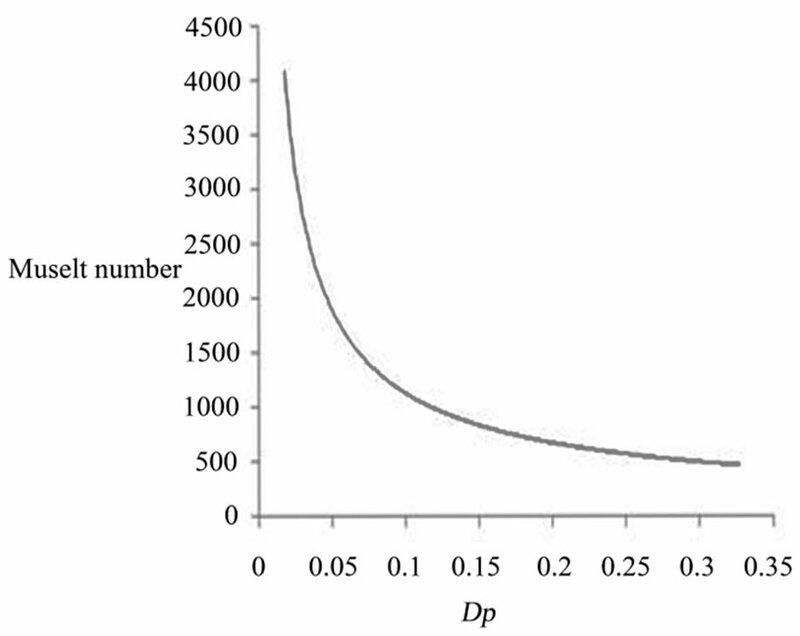 Although both the Nusselt number and pressure drop increase as the particle diameter decreases, the increasing rates of both parameters are different. For example, as dp decrease from 0.2 to 0.1, the pressure drop increase by 52% but the Nusselt number increase only by 30%. Thus a relatively larger penalty for pressure drop will occur when a smaller particle diameter is selected to enhance heat transfer. Figure 5. 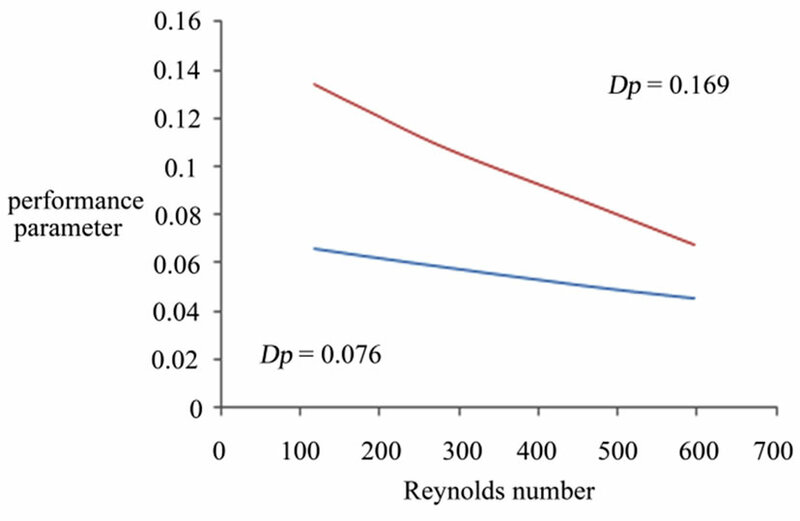 Effects of Reynolds number and particle diameter on the Nusselt number in porous channel. channel is also increased as discussed earlier. Figure 6. 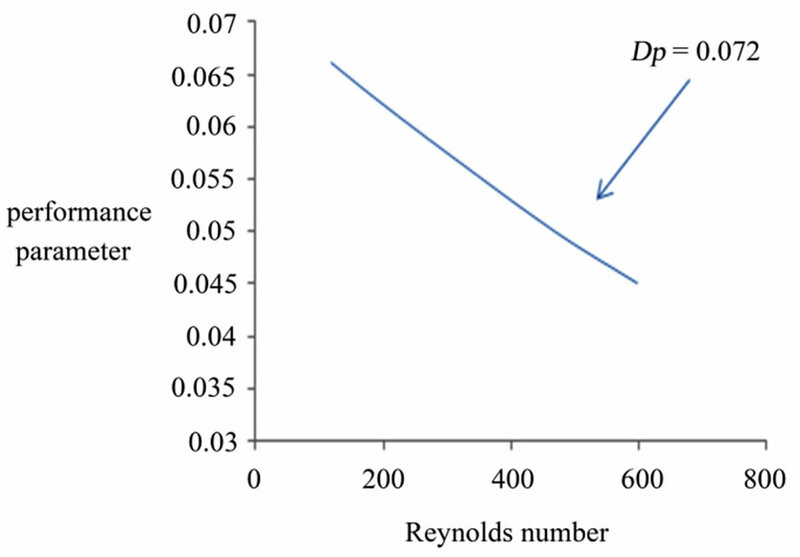 Effect of Reynolds number and particle diameter on performance parameter. Figure 7. 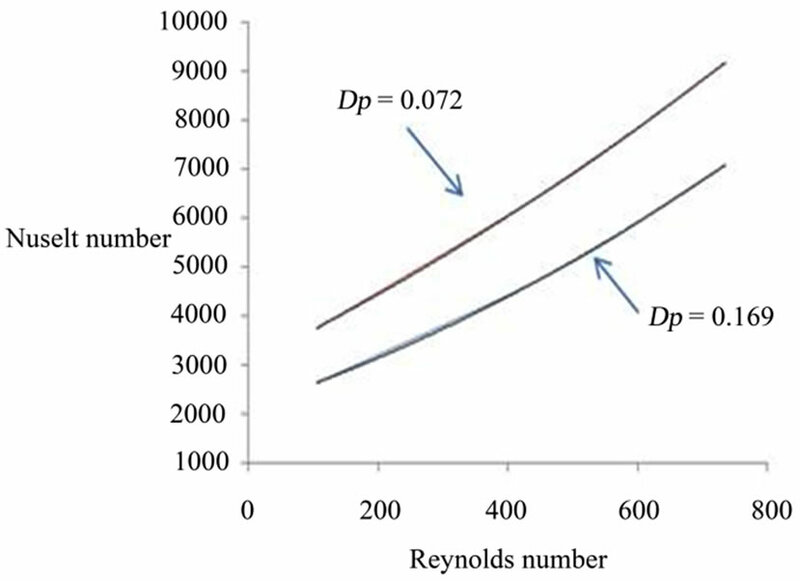 Effect of Reynolds number and particle diameter on performance parameter. Figure 8. 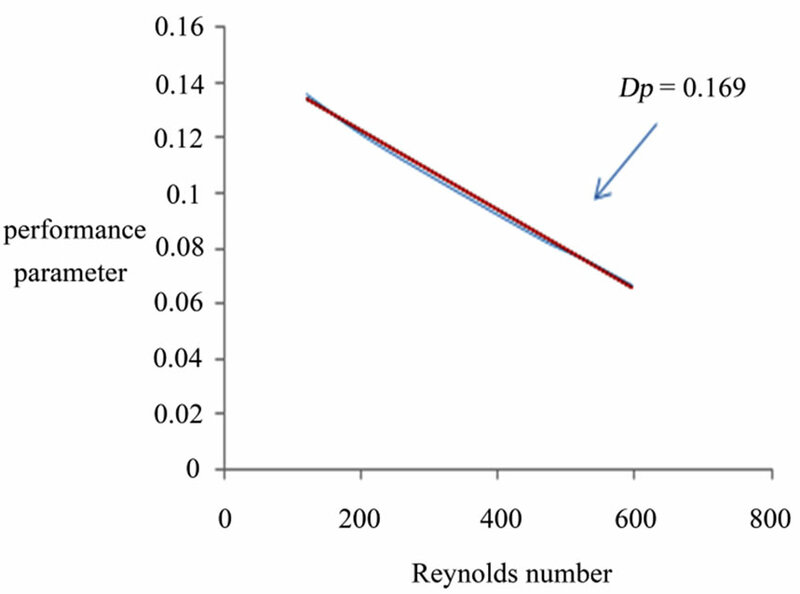 Compration of effect of renolds number and particle diameter on performance parameter. A numerical study of laminar forced convection in a two-dimensional porous channel with inlet and outlet ports was conducted. a smaller particle diameter can be used to achieve higher heat transfer enhancement , but a larger particle diameter leads to a more efficient performance based on heat transfer enhancement. T. M. Kuzay, J. T. Collins and A. M. Khounsary, “Enhanced Heat Transfer with Metal-Wood-Filled Tubes,” Proceedings of ASME/JSEM Thermal Engineering Conference, 1991, pp. 451-459. K. Vafai, “Analysis of Forced Convection Enhancement in a Channel Using Porous Block,” AIAA Journal of Thermophysics and Heat Transfer, Vol. 8, pp. 563-573. M. Sozen and K. Vafai, “Longitudinal Heat Dispersion in Porous Beds,” AIAA Journal of Heat Transfer, pp. 153-157. 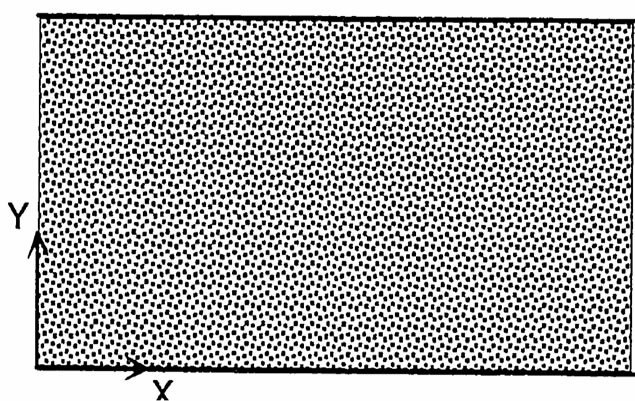 H. Chen and A. Hadim, “Numerical Study of Non-Darcy Forced Convection in a Packed Bed Saturated with Power –Law Fluid,” Journal of Porous Media, Vol. 1, No. 2, 1998, pp. 147-157.